This article introduces 10 best music app design in 2018. In this list, you will find lively examples of music palyer that have stylish, competent and refined appearance. On the way to/off work, people like listening music to kill the boring time on bus and subway. Music is one of the most inspiring "language", which becomes one of the highest proportion of consumption activities in the daily Internet life. A good-looking, full-featured music APP can always make users impressed. Apple Music could be a true music management service among the current Internet music services. With exquisite visual design and unified platform, Apple music has very rich resources for pop and classical music and first-class music streaming service. Also, it is one of my most commonly used software. Here, Mockplus sums up 10 best music app design which can compete with Apple music to meet your perfect experience both visually and aurally. Intimate is a lightweight APP. It aims at creating professional, personalized experience for the young by removing the complex features. When you open the APP, it will kindly ask your current state to automatically filter the music in line with the current mood. This player is very simple and easy to use, which removes the complicated functions. Except satisfying the users’ basic needs, it has the original interactive way and clear process. Color schemes are bright and tasteful. Listening music is a trendy lifestyle. This music prototype aims at providing the unique listening experience to everyone who has different music styles. With the tidy interface and beautiful colors, this prototype makes your eyes pop out. At the same time, the up and down switching mode of interface is also different. The prototype can recommend music based on the user's mood. This App focusing on user experience based on emotions and scenarios defining information structures. Zero player is a music application that offers personalized music services based on personal preferences and genre. Everything starts with a question: "What is a good music service?" The author holds the opinion that good music service makes your perfect life with customized music. Let's begin with zero!!! Color is comfortable, concise and generous. Personalized interface settings and unique pattern show the user a strong vitality. The breathing button sublimates experience. TEMPO is a motion-based music app. Everyone has their own rhythm of exercise, and each piece of music has its own rhythm. So the user can select the range of 40-180BPM music to adapt to the current speed of movement, avoiding the embarrassing situation that the speed of the music is not uniform and affect the movement. What TEMPO makes innovation is to dig deeper in the fitness field and to match specific rhythms to specific BPM music to enhance the experience and fitness results. Re/ is a machine learning & artificial intelligence-powered music player for your music library. It offers an automated and simple way to listening music. It always surprises you with songs that you haven't listened when you launch the app every time. Behind this music player, there is a complete set of intelligent recognition engine. It’s designed purely clean, trying to reduce the interference among users. The machine will learn further, deeper understanding of user needs. This application is a concept of a place where musicians can find bands to play with, and bands can find musicians too. Based on iOS interface. The overall information architecture is simple and clear and still maintains full functionality. The author redesigned Spotify to an outstanding design, using a combination of red, gray, and black colors to enhance the modernity and elegance. The background is also very smart through your habits to push the user's favorite music. Melody is a niche music application. With the pace of life changes, people are getting bigger and bigger. Listening music in the busy time that is the purpose of Melody. Fresh interface and outstanding clean style. This is a conceptual music social APP, where users can meet and join groups that share the same interests as one another following the Barnum effect. It can recognize your features by the soundtrack and adding groups that fit your characteristics. With a deep sense of conception, the author focuses on the social problems of apartheid and uses this music-based and voice-based approach as a new form of segregation of race. The author hopes to pass such a design in a relaxed and ironic way, urging people to understand each other. The Palace Museum welcomes you to explore The Night Revels of Han Xizai! 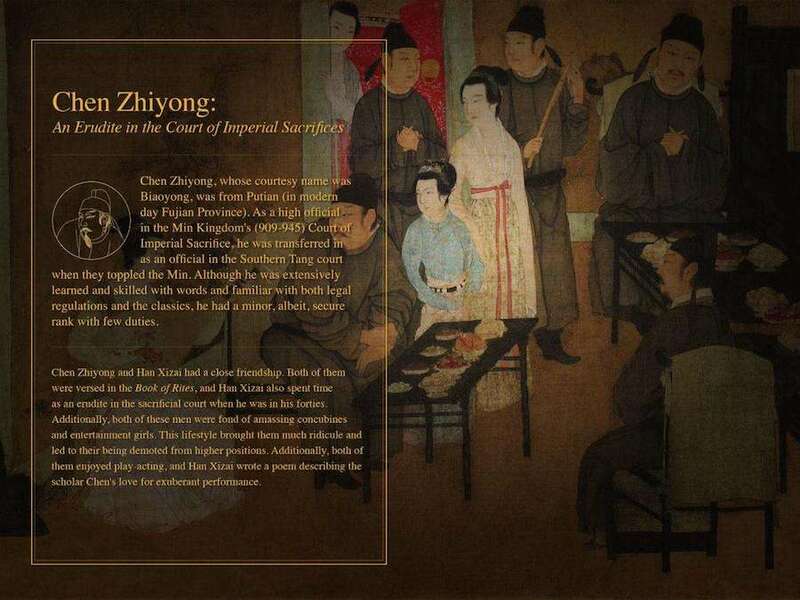 This iPad App will launch you into the world of the Five Dynasties period (906-960 CE) and allow you to see through the eyes of the alleged painter Gu Hongzhong. With artists from Beijing, Taiwan, and Hong Kong, this talented team presents you with high-definition images, captivating performances, and interactive scenes as an entertaining and educational journey! The design of the entire app is immersive so that viewers can understand this masterpiece from a multi-angle perspective, using the gestures for some page switching. interactive mode of appreciation has extreme original creation. The above 10 music prototypes and APPs are designed in different styles and features, including players, social music, and music art appreciation. What the music app attracts is the combination of nature and art, technology and experience. So, the human spirit and technology can be harmonized and unified. I hope the above works can give you full inspiration.